HELP’s Academic English Program is our main intensive English program (IEP). We offer full-time English courses in reading, writing, listening, speaking, and grammar as well as test preparation for the TOEFL ITP®. The curriculum is based upon current research and best practices in the field. We focus on preparing students for academic work at the University of Hawaiʻi or similar institutions. Students who successfully complete our curriculum may apply for conditional admission to the University of Hawaiʻi. HELP offers two 8-week terms for the Spring and the Fall, and two 6-week terms in the Summer. Please see our Term Schedule page for upcoming term dates and deadlines. HELP can also arrange for Short-Term Customized Programs for university and professional groups, or Private Lessons for individuals who want one-on-one tutoring. As part of the world-renowned Second Language Studies department at UH Mānoa, HELP also offers Specialized Training Seminars for teachers of English. Our 4-level Academic English curriculum accepts students of all levels – from those with very basic to very advanced English ability, and every level in-between. Placement in the appropriate English level ensures that every student can achieve success with our program. Level placement is based upon the University of Michigan EPT (English Placement Test) scores, a writing sample, and a speaking test, which are given on Orientation Day. Depending on their level, students take from two to four required core classes and zero to two electives. 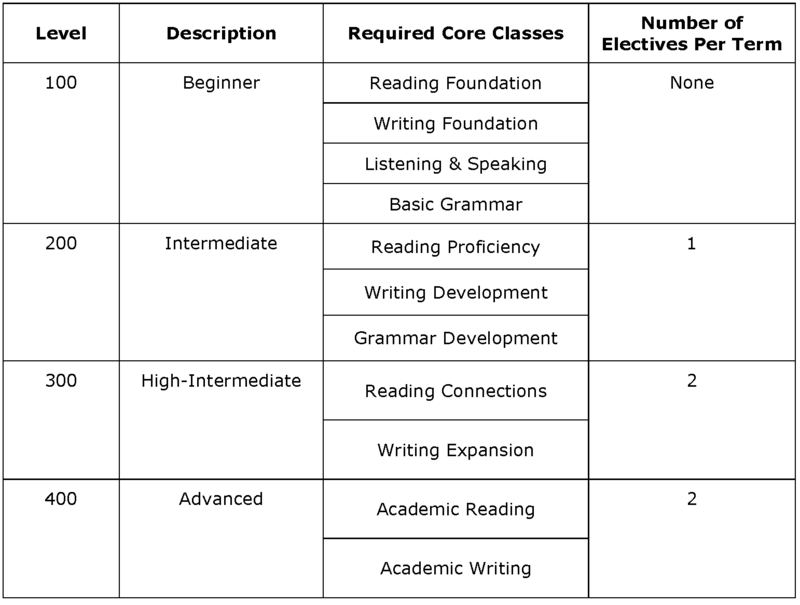 The electives vary each term. 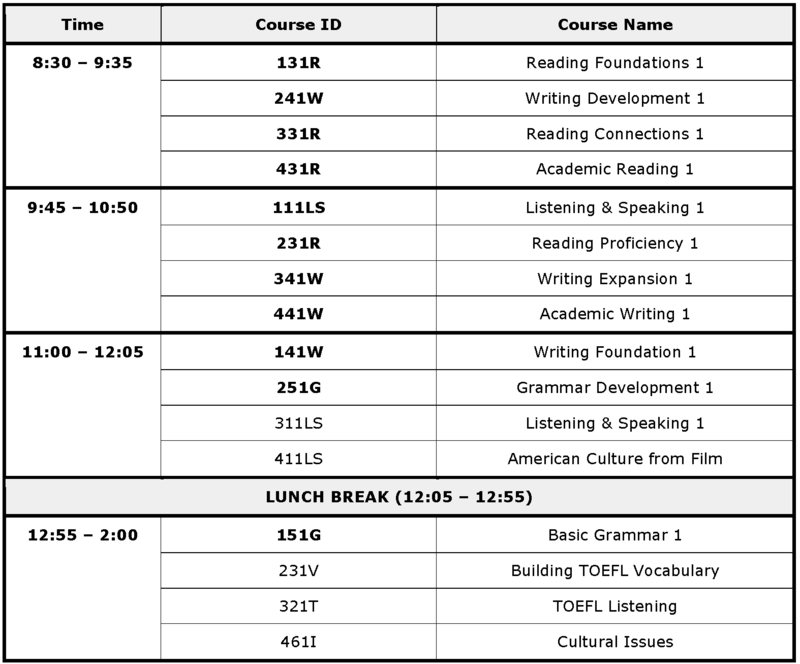 Classes for each skill are not at fixed times each term, which provides students with a college-like schedule. Classes of 65-minutes each are held Monday through Thursday between the hours of 8:30am – 2:00pm (schedule subject to change based on enrollment). Fridays are reserved for co-curricular field trips and service-learning experiences as well as for teacher-led extra-curricular activities. Most students study full-time for 20 hours per week with an F-1 student visa. Full-time students take four courses per term. Students who successfully complete their studies receive a certificate of completion. Please go to Course Descriptions for details about courses. With small class sizes of 6 to 16 students, HELP students have numerous opportunities to participate in class discussions, to ask questions, and to interact with classmates and instructors. Private lessons are held in one of HELP’s classrooms on weekdays, at a time of your choice between 8:30am-5:00pm. The minimum length of a lesson is one hour. Semi-private lessons can also be arranged for 2-4 students wanting to study the same topic or material. If interested in private lessons, please fill out the application form here: Private Lessons Application (PDF) and send it to eslhelp@hawaii.edu . The cost for private lessons is listed on Tuition and Fees.